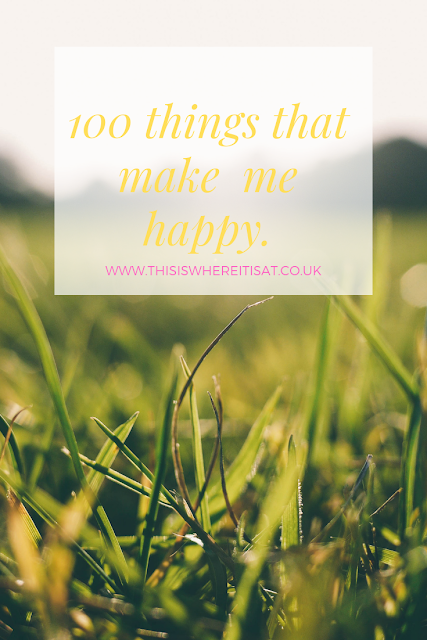 100 things that make me happy. As someone who suffers from depression, it can be tough going and sometimes it can be hard. That is why just seeing some simple pleasures can really brighten your day up. Also, I personally can come back to this post when I am having a downer and reflect on things that make me happy. 1) The smell of fresh grass. 8) Listening to your favourite song. 9) Soaking your muscles in hot water. 10) Caccooning yourself with the quilt in bed. 15) Taking an afternoon nap. 16) Lying on the grass and looking at the clouds. 20) Being cosy inside when the rain hits hard on the window. 21) Jumping in muddy puddles. 24) Watching the bubbles forming in a lava lamp. 25) Bare feet on grass. 26) Hearing the right song at the right moment. 27) Realising you have more time to sleep in the bed. 29) Walking in the countryside. 30) Being at the seaside. 31) Eating fish and chips at the beach. 32) Jumping waves on the beach. 33) Smelling the sea air. 34) A good old workout. 35) Blowing bubbles with kids. 36) Hot towels straight from the drier. 37) Watching children giggle and play. 38) Sleeping in on a rainy day. 39) Being a passenger on a drive in the dark. 40) Sitting on a hill. 41) Having a candle burn. 43) Taking your shoes off after a long day. 44) The smell of freshly baked bread. 45) Climbing into bed with fresh sheets. 46) Writing an ace blog post. 48) Turning over the pillow and laying on the cold spot. 49) Putting your feet out of the bed. 50) Stopping and smelling a flower. 51) Feeling the sun radiate on your face. 54) Emptying the wash basket. 56)Putting washing on the line. 59) The sound of birds singing. 61) Having all your clothes hung up nicely in the wardrobe. 62) Taking a nap in the sun. 66) Getting a ton books out from the library. 67) Having a brain wave. 68) Having a good old cry. 70) Watching daffodils open up and brighten a room. 73) Kicking through crunchy leaves. 74) Stripping off a face mask. 76) Wearing a dressing gown when it is cold. 79) Cleaning out the lint from the drier in one single swipe. 82) Watching Fail Army on youtube. 87) Buying a new packet of colouring pens. 88) Buying something in the sale. 89) Housetops covered in frost. 90) A field covered with untouched snow. 91) Writing out a proper letter. 92) Finding some money in your pocket. 93) Walking through a forest. 94) Learning a new skill. 96) Peeling of nail polish in a single strip. 97) Spotting a full moon. 98) Blow drying your hair. 99) Not feeling guilty for saying no. 100) Emptying your spam folder. It's so good to be able to write these lists sometimes. I love the one where you are cosy inside when it's bouncing it down outside. We have a flat roof extension and I love listening to the rain beating down on there! P.S. Just popping back for a second time to let you know that this post has actually been added to the BlogCrush linky TWICE in one week!!! Wow!